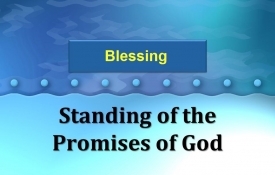 There will be no poor among you, however, because the LORD is certain to bless you in the land the LORD you God is giving you to possess as an inheritance. See, I am setting before you today a blessing and a curse: the blessing, if you obey the commandments of the LORD you God,which I command you today, and the curse, if you do not obey the commandments of the LORD you God, but turn from the way that I am commanding you today, to go after other gods that you have not known. You will be blessed above all peoples; there will be no infertile male or female amongyou or your livestock. "The LORD your God has multiplied you, and here you are today, as the stars ofheaven in multitude. May the LORD God of your fathers make you a thousand times more numerous than you are, and bless you as Hehas promised." GOD, your God, has blessed you in everything you have done. He has guarded you in your travels through this immense wilderness. For forty years now, GOD, your God, hasbeen right here with you. Youhaven't lacked one thing. He will love, bless you, and multiply you. He will bless your descendents, and the produce of your land-your grain, new wine, and oil-the young of your herds, and the newborn of your flocks, in the land He sword to you fathers that He would give you. "However, your real source of joy isn't merely that these spirits submit to your authority, but that your names are written in the journals of heaven and that you belong to God's kingdom. This is the true source of authority." "You will be My people, and I will be your God." Jesus, the Holy One, makes us holy. And as sons and daughters, we now belong to his same Father, so he is not ashamed or embarrassed to introduce us as his brothers and sisters! "And I will make of you a great nation, and I will bless you and make your name great, so that you will be a blessing. I will bless those who bless you, and him who dishonors you I will curse, and in you all the families of the earth shall be blessed."